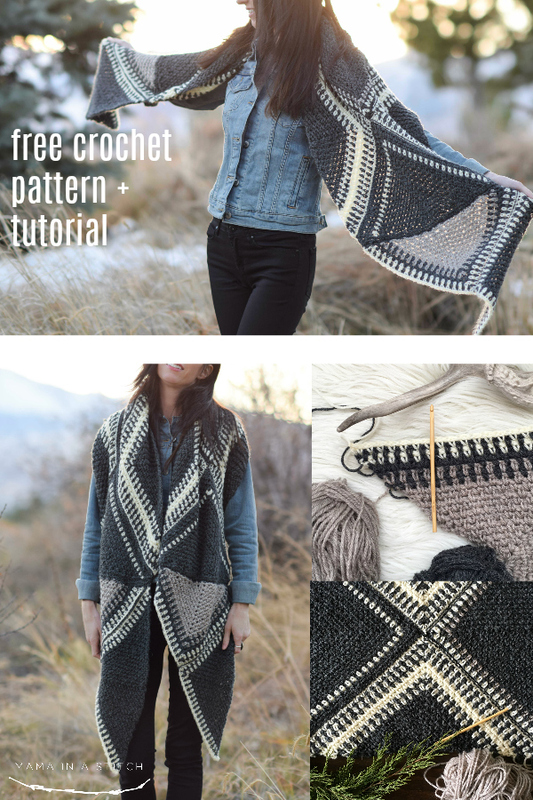 You may scroll down to see the free Las Cruces Crochet pattern below or choose to purchase the ad-free printable PDF pattern from my Etsy shop HERE. Yarn can be found HERE. This alpaca crocheted wrap that I’m sharing with you today is pretty unique for me as I don’t make a ton of shawls and wraps. 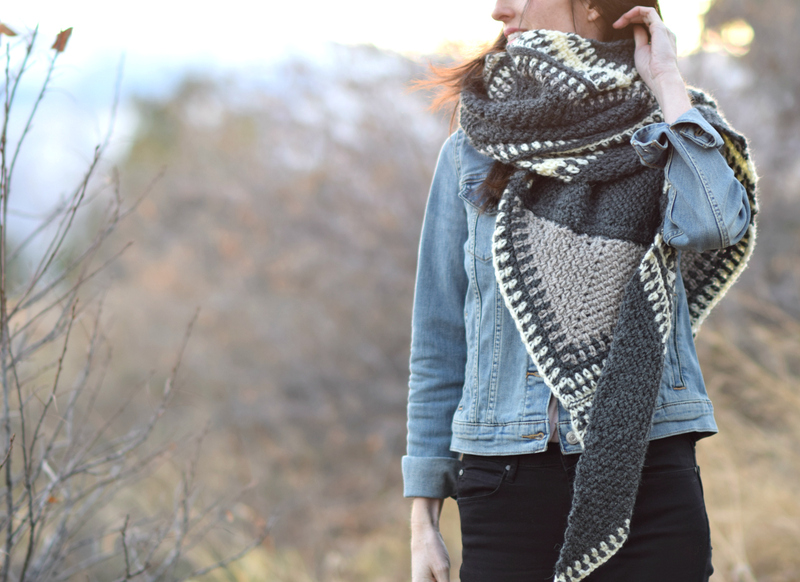 I love this piece because it works as a scarf as well – in fact, that’s how I prefer to wear it! 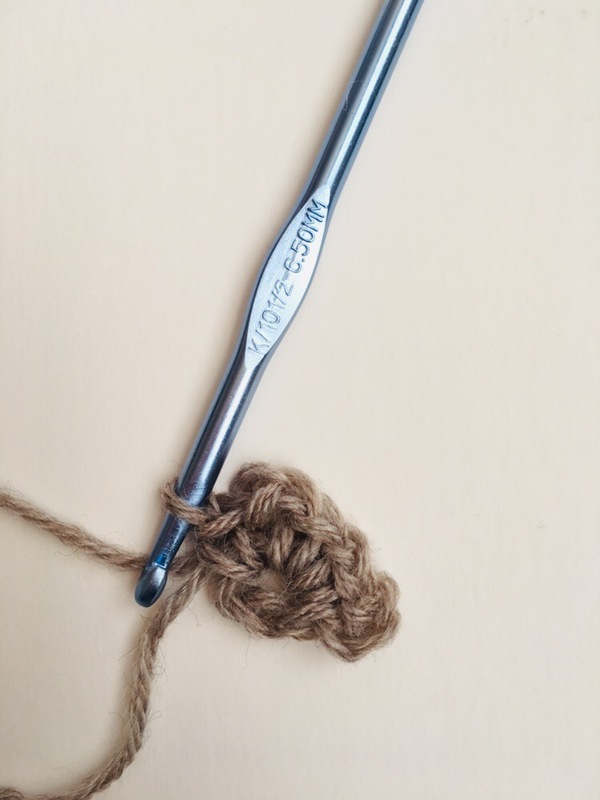 Knitting and crochet is special in that we can make things that we see in stores, but even better, we can make things that you could never find in a store. I’m pretty sure you won’t find anything like this in a store. 🙂 The best part is it’s very simple to make! To the untrained eye, this shawl looks complicated but it’s very simple. 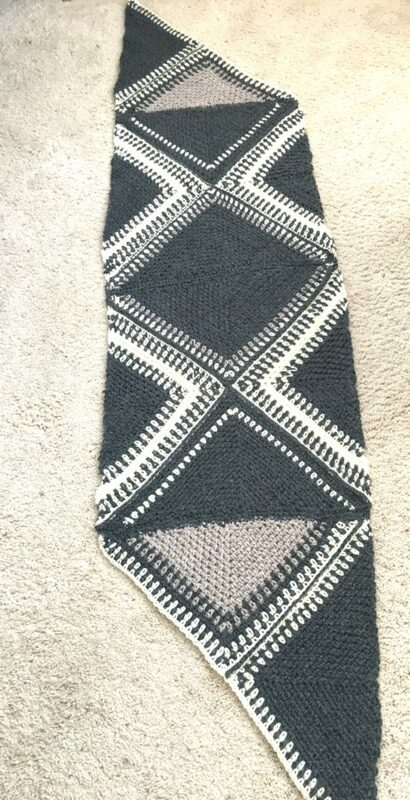 Like I mentioned earlier, it’s created by crocheting simple triangles and making occasional color changes. 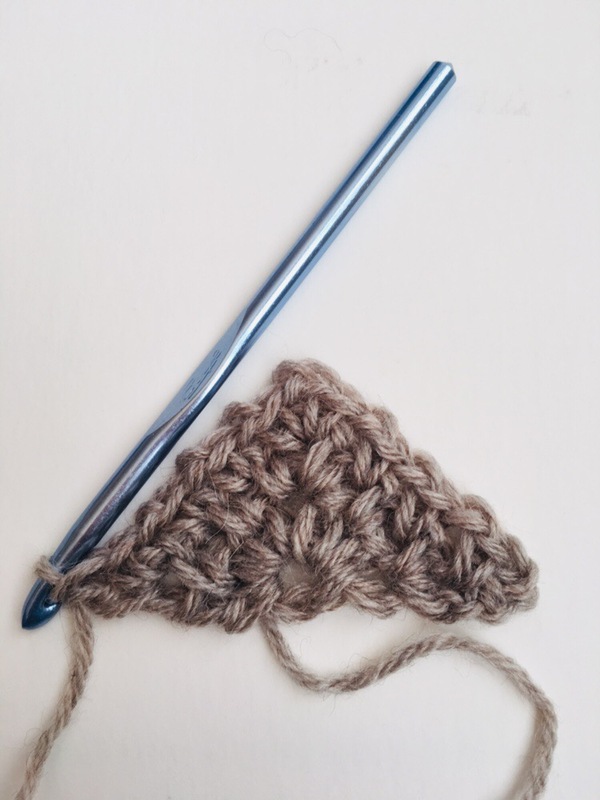 The granite stitch triangle is so simple that you’ll have it memorized after just a few rows. You can see the written pattern below as well as a full picture tutorial! 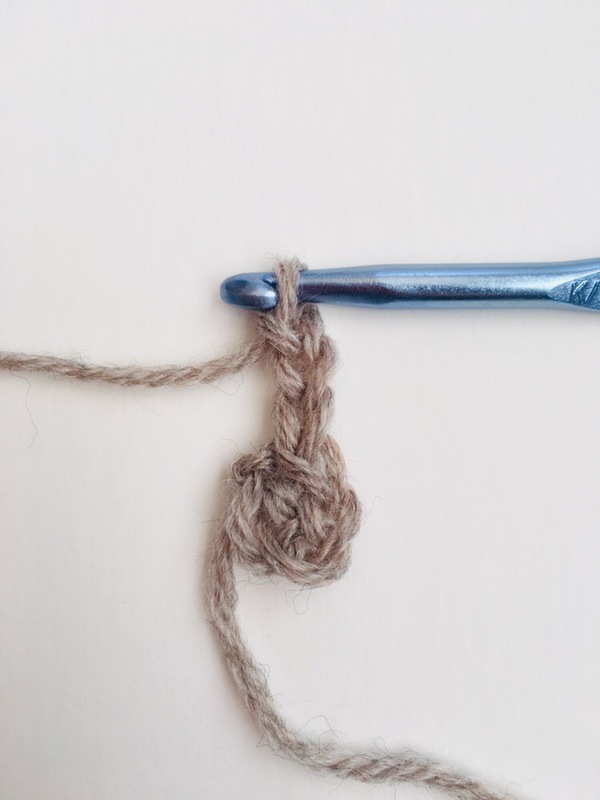 Grab your worsted weight yarn and try out the triangle and you’ll see how quickly and easily it works up. 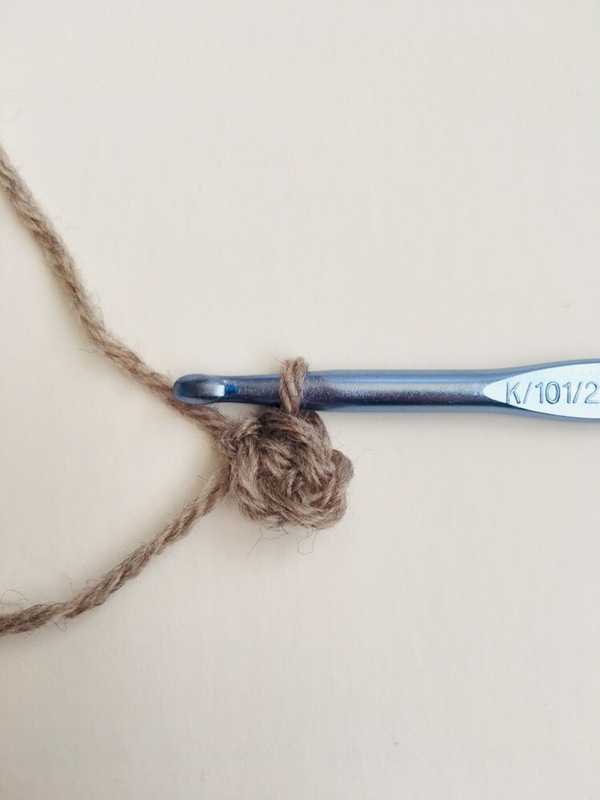 If you’ve never worked the grantite stitch, it wouldn’t hurt to practice a little swatch. You can see a picture tutorial for the crocheted granite stitch on my blog here. Below you can see one of the triangles. You will have the triangle pattern memorized pretty quickly! Below: Seam them together to make the pretty designs! 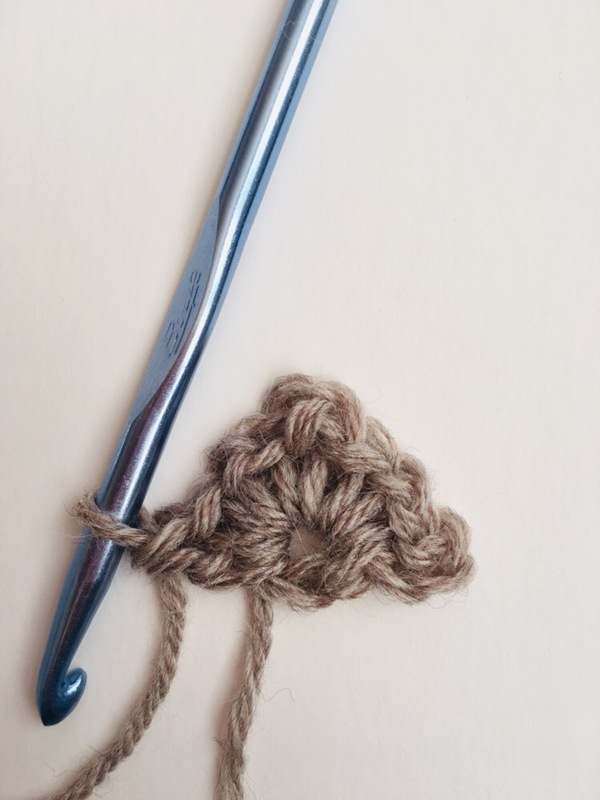 Let’s get to this simple crochet pattern! 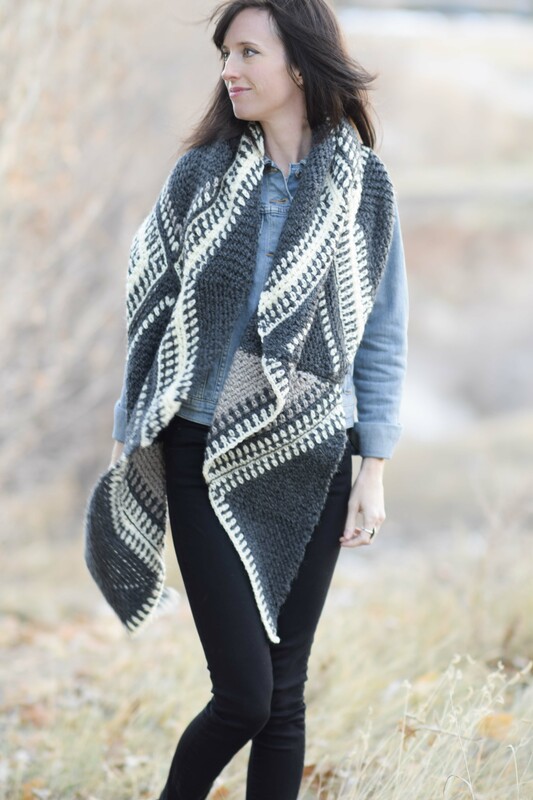 Pattern Description: An eye catching and comfortable alpaca wrap featuring beautiful stitch work inspired by southwestern textiles. 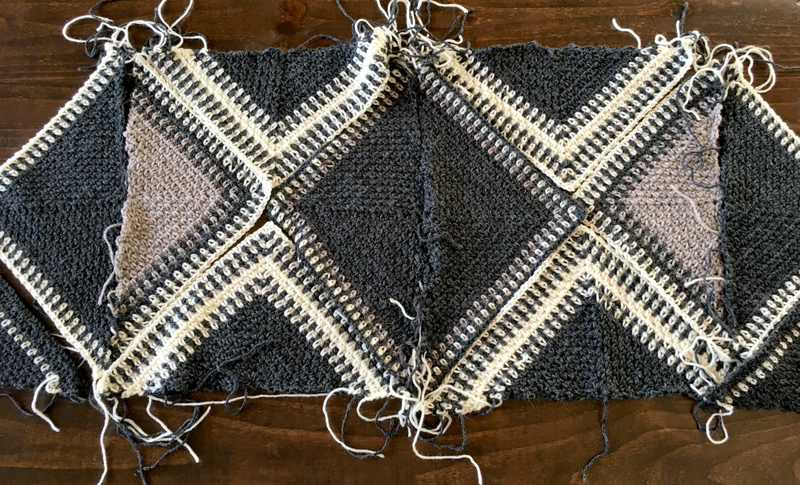 The “trails” of stitches cross and intersect, leading the eyes on a visual tour of the wrap and giving it the name Las Cruces. La Cruz is a trail or also a cross in the Spanish language. 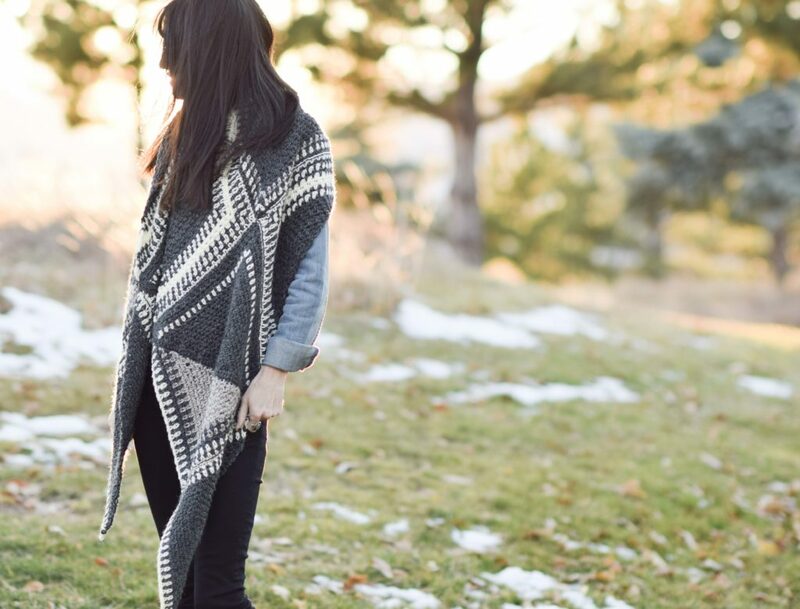 Neutral color tones will compliment any outfit and the patterns and shapes are sure to impress. Simple triangles are created and seamed together to create this easy, cozy wrap. Follow this pattern for each triangle (see instructions for Triangles #1 – #4 below) making color change where indicated. See photo tutorial below for additional assistance. 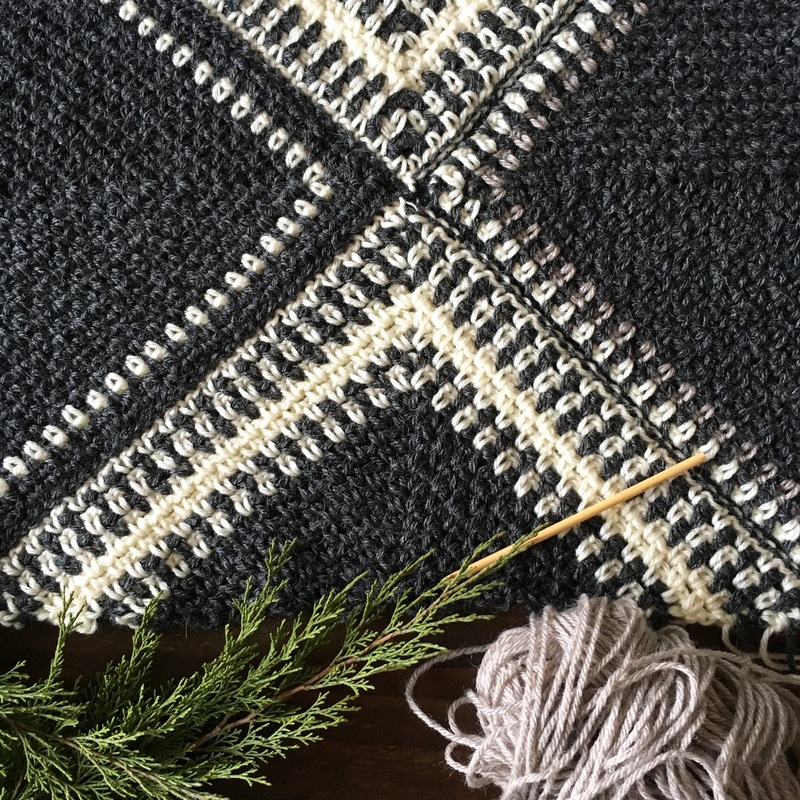 The stitch pattern is the granite or moss stitch. 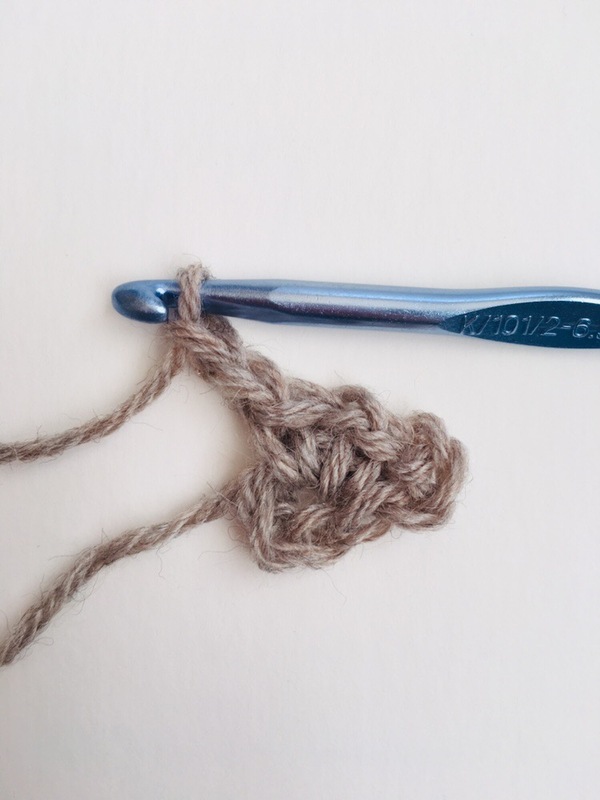 You will work single crochet stitches into the chain spaces. Row 1 Ch 3, sc in ring, ch 1, (sc 1, ch 2, sc 1), ch 1, sc 1, ch1, dc 1 in ring. Row 2 Ch 3, turn, sc in first ch 1 sp, ch 1, sc in next ch 1 sp, ch 1 (sc, ch 2, sc) in ch 2 sp, ch 1, sc in next ch 1 sp, ch 1, sc in final ch 1 sp, ch1, dc in same sp. Row 3 Ch 3, turn, sc in first ch 1 sp, ch 1, *sc in next ch 1 sp, ch 1. Repeat from * across until you reach the ch 2 corner space, (sc, ch 2, sc) in ch 2 corner sp, ch 1, *sc in next ch 1 sp, ch 1, Repeat from * across until you reach turn ch 3 space, (sc, ch1, dc) in final space. Repeat row 3 until you’ve worked 20 rows, making color changes where indicated. Tie off and weave in ends. 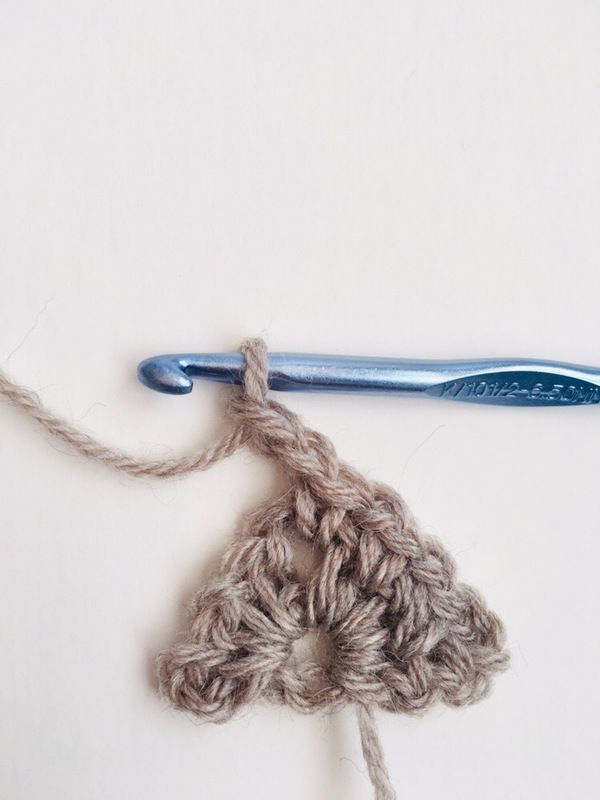 First, you will crochet a single crochet edging along the bottom ONLY of 6 triangles. This edge will make it easier to seam them together as these edges aren’t as “clean” as others in order to seam. Attach yarn and single crochet one row along the bottom of both Triangles #1, 2 of the Triangles #2, and both Triangles #4. Tie off and weave in all ends. 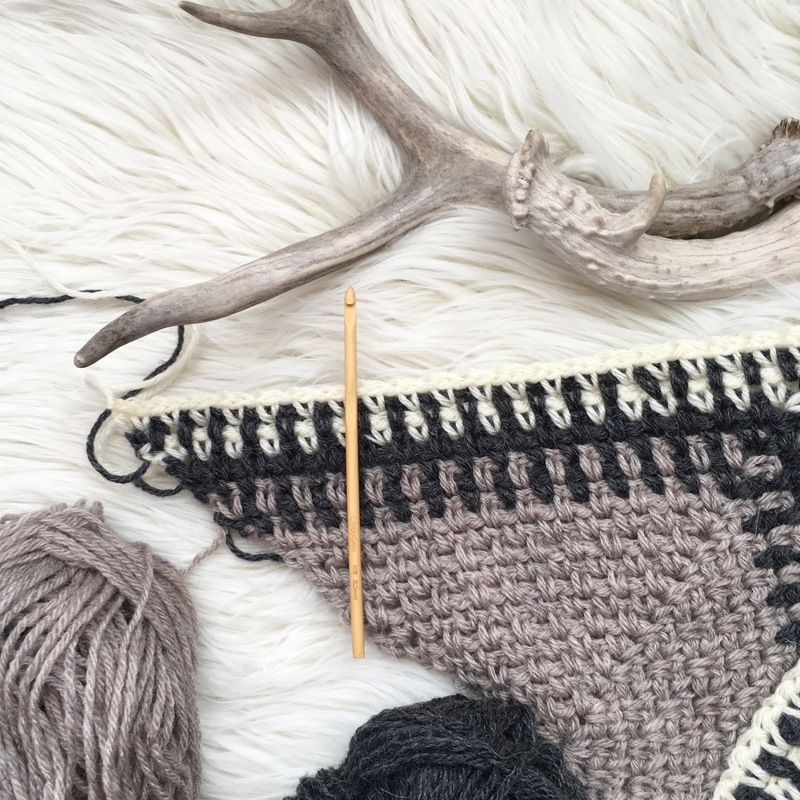 You may also choose to add a border or tassels! Block to shape and size as desired. This might be how it looks as you put it together! Row 3 is worked just like row 2 in that you chain 3, sc in ch 1 space then will alternate single crochet and chain stitches, working single crochets into each chain space across the row until the chain 2 corner space. 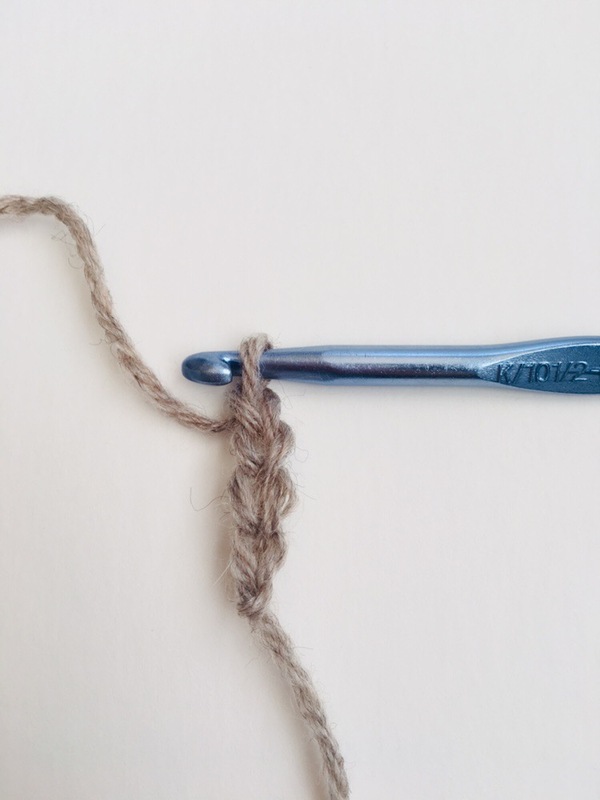 (Sc, ch 2, sc) in the ch 2 corner space, then alternate the chain and single crochet stitches until the final space, in this case the turn ch 3 space. 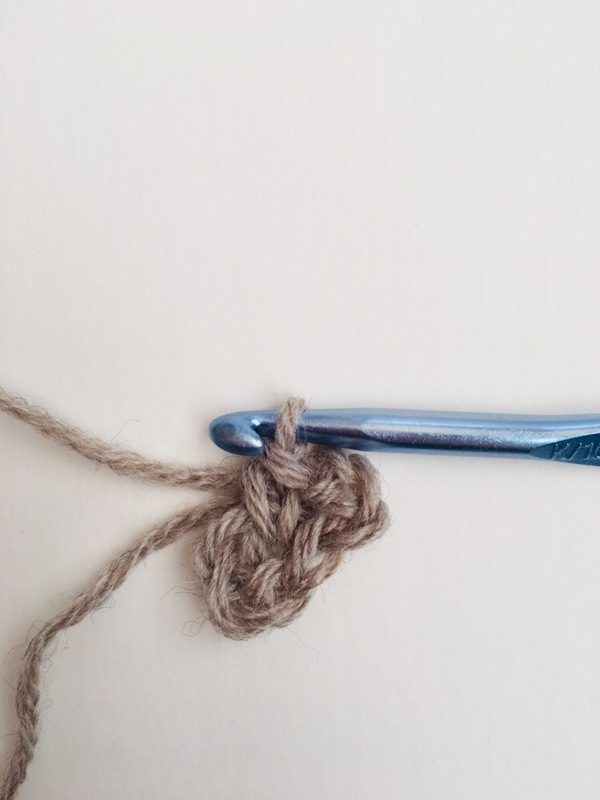 Crochet (sc, ch 1, dc) in turn ch 3 space. Repeat the stitch pattern from row 3 for remainder of triangle. I hope you enjoyed this unique project. It was fun to create something a bit different and it’s been so nice to wear. I’d love to hear your thoughts or questions! Well, now I have to make this because I am from the southwestern city of Las Cruces! Yeah Amy! It was made just for you ! We love New Mexico and try to visit Santa Fe each year. Lucky you! Oh my goodness… I just love this! I really wish I could just stay home all the time to make all these awesome things that your create for your blog. Your work is gorgeous and really inspiring. Thank you Amy! I hear ya – so many projects to make and so little time. Ugh!!! Have a great weekend! I love this! I can imagine this in bright colors for a completely different style. I’m going to make mine in light neutral colors. You are right about working with dark yarns. I’m knitting a dark blue beanie just now and find it very difficult to see the stitches. The yarn is bulky! Fall is not the time of year when I manage to work with dark yarns. All the light is eaten up by…Halloween monsters? Lol!! Halloween monsters. Well, we can move on from that now. It is so true about dark yarn. It’s hard to see for sure. That’s so awesome that this is what you were wanting to make (the granite triangles) They really are fun and easy! Absolutely love this! 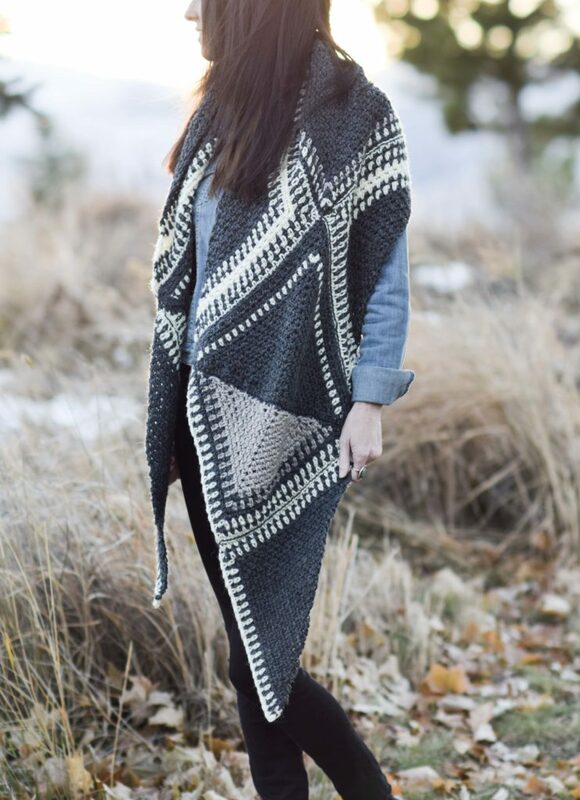 Any hope of getting it in a knit pattern for us knitters? Unfortunately I’m not bistitchual! Hi Julie in the UK! Thanks so much for taking the time to let me know that you enjoy these projects. Your words mean a lot to me! Blessing to you as well! Hello Jessica, Were has the time gone? We can’t believe November is here! The season for pumpkin pie, and spending time to knitting and crocheting has arrived. 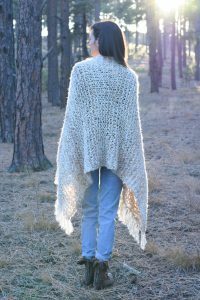 Thank you so much for the pattern ¨Las cruces wrap crochet¨ Just Beautiful!! So true – where has the time gone? Isn’t it a great time of year Diane? I think it’s my favorite. Thank you so much for your kind words about the wrap – it was a lot of fun for me! I’d love to make this for my daughter for her birthday, but the Lion Brand taupe and charcoal is sold out in Canada. Racking my brain to come up with a suitable colour combo. Any suggestions? I think any grey or neutral color tones would make good substitutes! 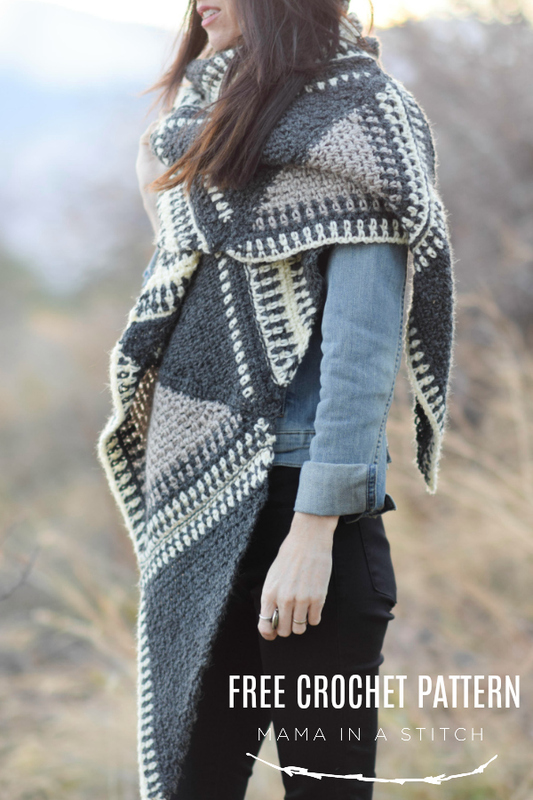 There is a lighter grey in the Touch of Alpaca and there’s also a beautiful blush tone that would look awesome. Hope this helps! 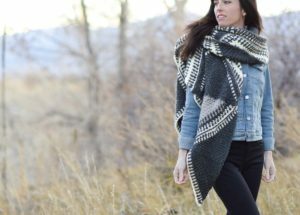 Love the pattern making a wrap now! Can I make a single wrap from one triangle? 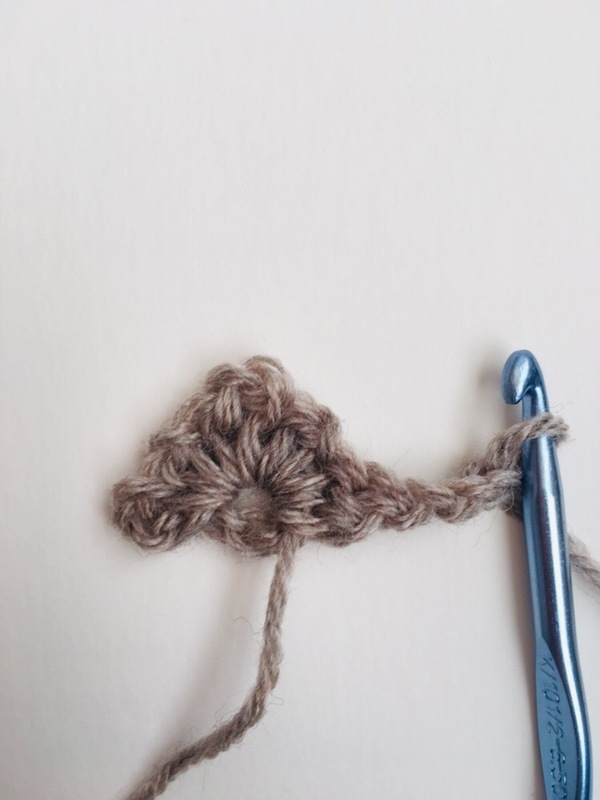 I love this stitch! 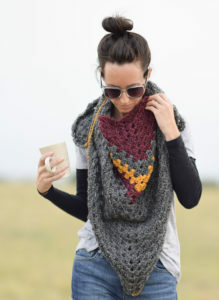 Can I continue to make larger triangle wrap without adding 12??? Absolutely Millie! 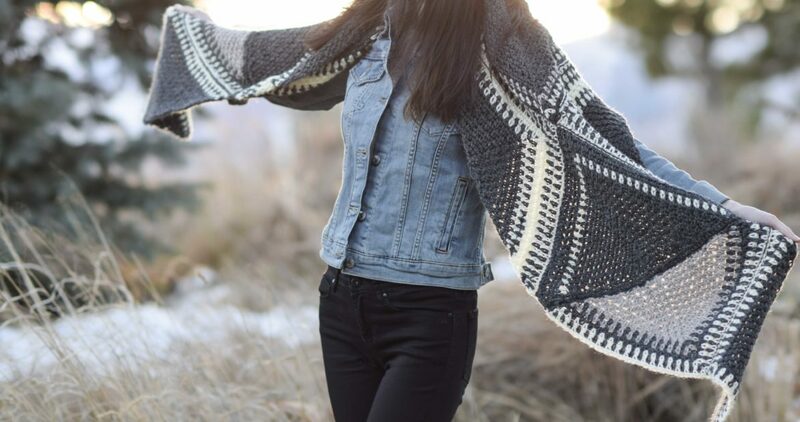 Just make the triangle as big as you want to create a wrap with one! 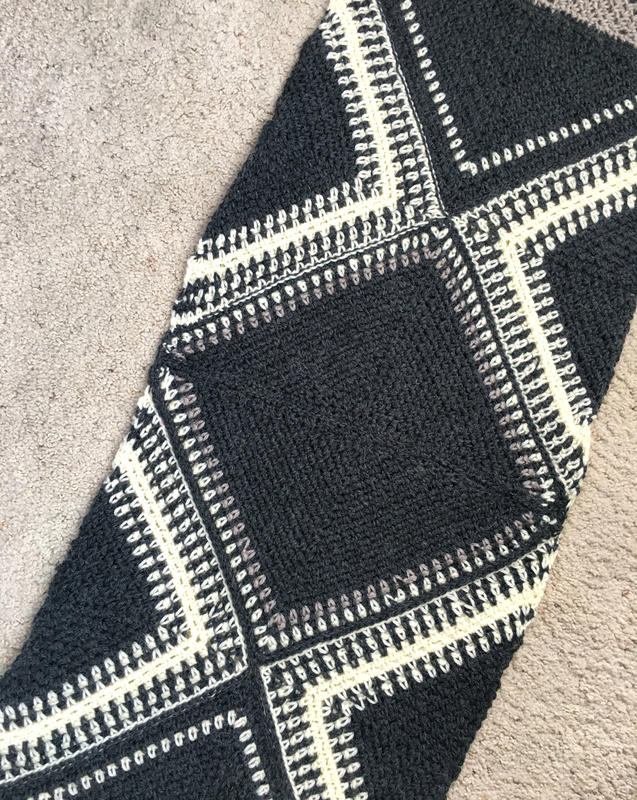 These triangles make a beautiful afghan. Love this pattern. Hello… this is absolutely beautiful. I don’t do well at stitching squares together..have you ever just made it into a big triangle shawl. ?